Proximity to the airport, land availability, reducing supply in nearby sub-markets, infrastructure improvements and affordability will trigger new housing supply in the Dhanori region. Lohegaon is a suburb of north-eastern Pune with its chief claim to fame being the location of Pune Airport. The airport is also an Air Force base and one of the oldest airbases in India. Dhanori is located adjacent to Lohegaon. It is a rather nascent market for the housing sector but is witnessing spilloverdevelopment on account of its proximity to the better-known residential hub ofViman Nagar. There are a few indicators that Dhanori and nearby Lohegaon / Charoli could be on the cusp of major residential sector led development. We try to assess the factors that could fuel development in the region. Before that, we look at the current scenario. With residential inventory declining in sub-markets such as Kalyani Nagar andKoregaon Park, fuelling a price increase, the focus has shifted towards VimanNagar and Nagar Road. Residential real estate growth in Viman Nagar has been much quicker than expected, driven by the IT / ITeS sector nearby and the working class employed in the central parts of the city. Even nearby Vishrantwadi andTingre Nagar have witnessed an increase in their prominence, although they have not picked up enough traction due to the existing unorganised and non-availability of quality infrastructure. The interest of developers has now moved further towards Lohegaon and Dhanori, which are emerging as the new residential hubs in the neighbourhood. While Dhanori has already witnessed substantial residential development on the stretch just off the main Lohegaon-Dhanori Road, the defence establishments and height restrictions due to the airbase have been impediments in the way of larger real estate developments in Lohegaon. The major developments are in the form of stand-alone and small residential projects / individual houses. Due to the proximity to major defence installations in Lohegaon, the demographic profile of Lohegaon is currently inclined towards defence personnel. The dearth of developable land parcels and the increasing real estate prices in Viman Nagar have led to significant real estate activity in the region. This activity is primarily led by small and mid-level developers who are targeting the affordable and mid-segment buyer. In Dhanori, the profile of development is similar but the scale is bigger on account of the availability of more land. The primary real estate drivers for this region have been the development of VimanNagar and Kalyani Nagar as premium residential locations and the emergence of the IT / ITeS and retail corridors of Nagar Road and Kharadi. The next wave of growth is likely to come from the Dhanori region. The current residential prices in the sub-market range from INR 3,400 to INR 4,500 per sq ft. Dhanori has witnessed an overall annual appreciation of about 6-7% in the last two years. The limited supply of Grade A projects has kept the quality-conscious buyers away and the influx of quality supply will change the overall residential texture of the region. 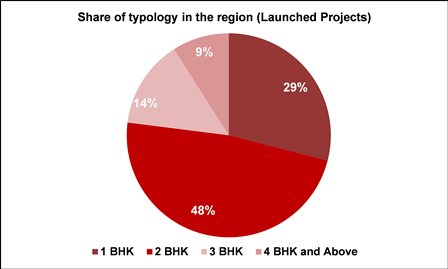 The current residential inventory and supply are skewed towards affordable and mid-segment (price bracket from INR 3,400 to INR 4,500) housing projects with configurations in the one and two BHK sizes, together contributing more than 75% of supply in the launched projects. The social and physical infrastructure of the Lohegaon-Dhanori region is showing signs of improvement. Infrastructure aspects like the concreting and widening of existing roads are a big pull factor for residential projects in this area. The State Government is also planning to improve the connectivity of Lohegaon with other parts of Pune. The 170-km-long proposed Ring Road, which will pass from neighbouring Charoli (2-3 km from Lohegaon-Dhanori), will act as a major driver to spur real estate activity at a faster pace in this region. However, the area of Lohegaon has certain height restrictions for development, which have been a deterrent to faster real estate growth in this area. On the social infrastructure front, the region is dependent on entertainment available in neighbouring Viman Nagar. The Phoenix Market City and Inorbit malls on Nagar Road provide a ready source of retail and entertainment. The region is well connected, with educational institutes and healthcare facilities available inViman Nagar and on Nagar Road. Currently, Dhanori and Lohegaon are not centres of economic activity that can act as a magnet for real estate growth. The demand here depends on the commercial developments in Kharadi-Hadapsar, Yerwada and on Nagar Road. The high residential prices in the established locations are leading to mid-segment buyers to look actively at growth corridors such as Lohegaon and Dhanori due to their comparatively low prices. It is expected that the average appreciation of residential prices in 2016 is likely to be 6-9% in the region. Growth areas such as Dhanori and Wagholi are likely to gain more traction in terms of sales. Lohegaon is likely to see spillover demand from more mature sub-markets like Viman Nagar and Nagar Road, but the pace of development and newer launches will be the drivers for bringing buyers here.